If the spouses agree, a public notary can dissolve a marriage and grant a divorce. The procedure is straightforward, fast and inexpensive. But parties must agree all issues, including child arrangements, finances and division of joint property before the notary will grant a divorce. If there is no agreement the parties may have no choice but to use the more cumbersome local family court procedure. As far as the financial settlement is concerned, the courts will apply the Civil Code rules. This means any property acquired before the marriage and any property acquired solely during the marriage is retained by the spouse who acquired it. It is up to the spouse claiming particular property should be treated as separate to prove that it was obtained by him or her alone. Courts will also give effect to the terms of any marriage contract signed in anticipation of marriage (i.e. prenuptial agreements). 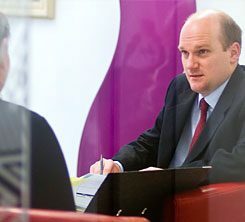 We are specialist divorce solicitors and family lawyers and we advise clients who have a connection with Latvia. Our clients can include those who are UK–based but originate from Latvia, are living in Latvia but have a connection with England or Wales, were married in Latvia, or have other family connections with Latvia.